With only 250nm or so to reach Flores, the low developing from the west was forecst to be nasty and fast moving. We decided that a 40kn+ blow and 5m seas at the tiny marina and anchorage of Flores might not be ideal. The wind was due to arrive as we were due to arrive. Not good. Changed plans and headed a further 100nm to the island of Faial, and the marina of Horta. Yesterday and today we’ve had light winds (8-11kn), and fortunately some favourable current. We’ve maintained a course of 60degrees for the past 500nm and with wind from behind, today we had no option but to wing-out to keep our VMG close to our SOG (velocity made good vs speed over ground). At this stage, even an increase of half a knot over 500nm can mean arriving half a day earlier. Today our speed isn’t fast at around 4.5kn, but the seas are calm and the conditions allow us to relax and enjoy the sailing. 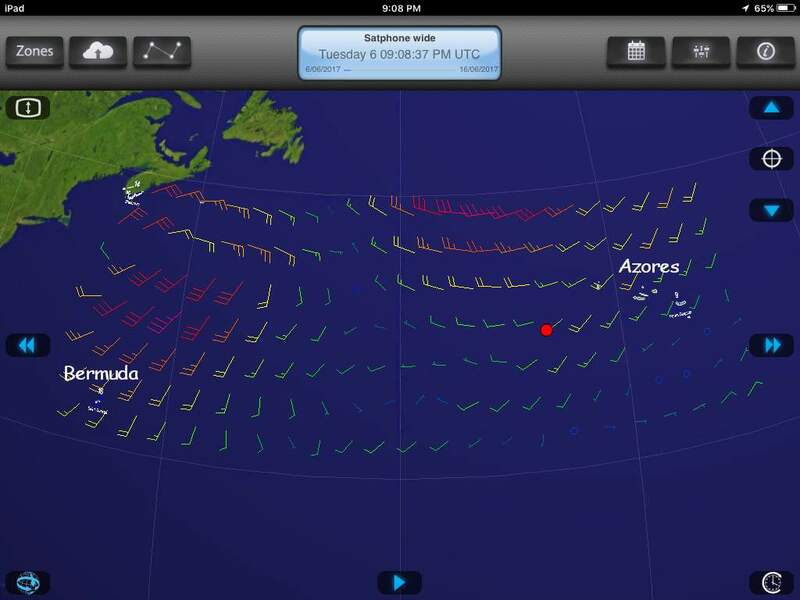 At 8am this morning we have 565nm to reach Flores / 670nm to Horta and the wind has picked up. A recently downloaded weather GRIB file shows a strong low building in the west and likely to pass over us later this week. As luck would have it, right when we expect to arrive! We are unsure how safe the tiny anchorage at Flores is in strong winds and large seas, so we’ve decided to head to Horta for our Azores arrival riding the storm out at sea. That adds a further 100nm to our voyage, but after the first 2000nm what’s another 100? Despite the forecast, the sailing over the past two days has been like sailing in the trades winds. Steady 15-20k from the SSW and Blue Heeler clocking 150nm days, but it’s not fast enough for us to reach Horta in time to hole up from the forecast blow. It’s almost 1am and the night air is cold. The ocean temperature has now dropped below 20degC. Blue Heeler’s sails are reefed but we’re sailing along at 6.5kn, thanks to a slight current. I’ve just spent the past couple of hours watching movies on my iPad, looking around now and again for signs of life on the horizon. The AIS alarm hasn’t alerted me to other marine traffic, not that there’s much out here anyway. We’ve just crossed into latitude 37N and longitude 37W at the same time. Wayne will relieve me at 2am and I’ll enjoy the warm bed until 6am when I’m back on watch and start a new day.